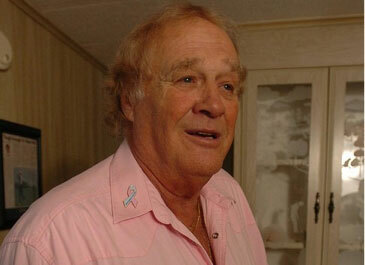 Approximately 1 percent of all breast cancer cases are diagnosed in men. In other words approximately 2,000 men in the United States and about 200 men in Canada will be diagnosed with breast cancer this year alone. As a result, approximately 450 men in the United States and about 45 men in Canada will die from this disease in 2011. A very dear friend of mine, Barbara Francis of Fairfield, Ohio, was always giving back to others, and in 2006, she helped me realize that having such a rare disease put me in a very special position. By talking publically about male breast cancer, I could increase awareness and help other men deal with the disease. In 2006, I began my mission to increase awareness. I am now a 6 1/2-year survivor, and I continue to spread the word. In 2006, I began my journey to increase male breast cancer awareness by purchasing a Wrangler “Tough Enough to Wear Pink” western shirt and speaking wherever and whenever I could. In July 2009, I launched www.malebreastcancer.ca, which provides information and support to other male breast cancer patients, survivors and their loved ones. The website currently averages about 70 hits a week. I am also the founder and president of “A Man’s Pink”; a not-for-profit advocacy organization that supports our website. A Man’s Pink was incorporated in Canada in August 2011. The current survival rate for men diagnosed with breast cancer is about 79 percent, compared to 87 percent for women with a similar diagnosis. There are several reasons for this. 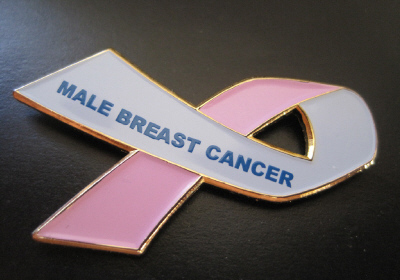 The male breast is much smaller and the cancer tends to be more aggressive. The lack of awareness in men causes many tumors to go undetected for a longer time in men. Many men are unaware that breast cancer is a disease that can affect them, and men, in general, are reluctant to seek medical advice, especially regarding a breast issue. We have to overcome this and educate men to get any changes in their breasts examined immediately. In October 2009, A Man’s Pink joined forces with Out of the Shadow of Pink and the Brandon Greening Foundation to establish a proclamation to designate the third week of October as Male Breast Cancer Awareness Week. As a result of our efforts, Hernando County and the state of Pennsylvania designated Male Breast Cancer Awareness Week in 2010. This year, Florida and Pennsylvania passed resolutions to designate Oct. 17 to 23 as Male Breast Cancer Awareness Week. A similar resolution will be introduced to the Provincial Legislature in Ontario, Canada. Inform all the men in your life that breast cancer is a disease that can affect them. In terms of awareness and treatment, male breast cancer is where female breast cancer was 25 years ago. Increasing awareness is a matter of life and death for men. Early diagnosis is the key to survival. Together we are making a difference!